Tohono O’odham Utility Authority, a tribal entity, was originally established in 1970 as the Papago Tribal Utility Authority (PTUA) by the Papago Tribal Council. The original charter authorized it to provide electric and water service to the reservation. 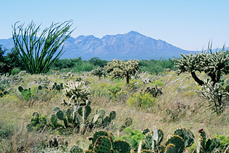 Today, TOUA’s service delivery area includes the main reservation and the San Xavier District, located southwest of Tucson. TOUA employs 100 people. Its main office is located 1.5 miles west of Sells, Arizona, tribal headquarters of the Tohono O’odham Nation.